Heat the grill. Mix together the butter and garlic puree and season with salt and pepper. Brush 1 side of the bread with a tablespoon of the butter and place on the grill, butter side down and grill until golden brown; turn over, top with the cheese and grill for 30 seconds longer or until the cheese melts. Remove the steak from the refrigerator 30 minutes before grilling. Heat grill to high. Brush steak on both sides with oil and season with salt and pepper. Place on the grill and cook until golden brown and slightly charred, 4 to 5 minutes. Turn over and continue grilling to medium-rare doneness. Remove from the grill and let rest 5 minutes. Slice into 1/4-inch thick slices. Mix together ingredients in a small bowl. Season with salt and pepper, to taste. 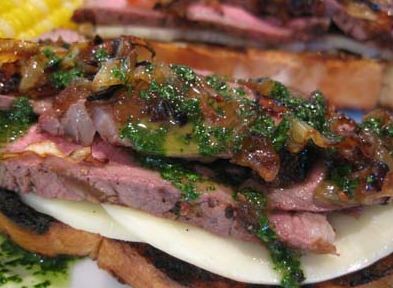 Place the garlic bread on a platter and top the cheese with a few thin slices of the beef and drizzle with the parsley oil. Another great looking dish Nick. I don’t know if you answered this before but what kind of camera do you use to document your posts? The pictures always look really great. Yeah Turk, I asked the same question the other day. What are ya using Nick? Nick, Garry and I make this all the time! Although we usually use a London Broil that I pound the crap out of! Oh, instead of cheese, we use mushroom gravy…..YUM! Although nothing compares to this meal at a good ol’ fashion beefsteak! I added in carmelized onions to top it all off as you can see in the last picture. Smart thinking. Don’t get a Sony. Ours was less than 2 years old and the push button broke off because it was a cheap pastic piece underneath the button. Nick, where’s the heat, man? Give us a rec for firing this up. Pureed fresh habs right in the butter, perhaps? Looks great! This inspires me to post my recipe for Steak a la Portuguese in the near future. Recipe does look good, could use some spicing up though. My mouth is watering!!!! Great ides to puree some peppers into the butter and you could even use one of the many hot rubs that are out there to add some spiciness….YUM! Look like you need some of my All Spice Cafe Chipotle Garlic sauce on that steak sandwich! I use it all the time with a delicious tri-tip roast. This looks awesome! I’ll definitely try it, but I like mine more on the rare side (like really rare drippin’ blood). Let me help you guys out looking for some heat. Take 4 Tbls butter melt in large skillet, add one cup of coarsley chopped mushrooms, (I like to mix brown and white) 1/2 cup sweet marsala cooking wine, and 1/4 cup of your favorite peppers ( for me I would probably mix red bell, hab, and Jalapeno) 1 hab, 1 jala, and the rest red bell for the sweet and heat. Simmer till the shrooms are done to your liking and serve on the sandwiches and as a side. Don’t forget to serve a few extra slices of bread to absorb the marsala butter goodness.